If you haven't used silicone gloves in the kitchen, you may want consider taking the plunge. This pair of silicone gloves is certainly a good place to start, although you may want to consider other options if you have large hands. The OXA Silicone Cooking Gloves allow you to handle food directly without using a potholder or oven mitt. Read our OXA Silicone Cooking Gloves review. The OXA Silicone Gloves can be found online for $9.99. 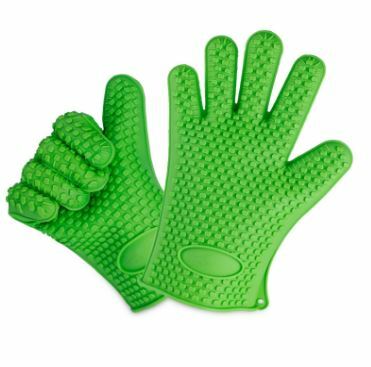 Silicone oven gloves have become a standard kitchen item in recent years, challenging potholders and oven mitts as the de facto hot-food handling utensil. This pair of silicone cooking gloves is currently listed as a Best Seller in its class on Amazon. Using this item is simple: You don a pair of liner gloves first, then place these over your hands. You’ll then be able to handle hot food with your hands, and without the need of an oven mitt or pot holder. The gloves are BPA free and said to be one-size fits all. A number of consumers have said that it runs small, perhaps too small for those with large hands. A pair of cotton liner gloves are also included to improve user experience. This does help the gloves come off easier, and reduces sweat, but it makes the already-small glove even more difficult to fit. While you can’t expect the same dexterity as you have with no gloves on your hands, these are certainly a step up from potholders in that regard. Washing them is a cinch once you are finished. Although they are said to be dishwasher safe, it is even easier to simply soap them up while wearing them in the same manner that you’d wash your hands. Although these types of gloves are increasing in popularity, keep in mind that their protection from heat isn’t long-lasting. A very hot item will eventually start to transfer enough heat that you’ll feel it. For most uses, however, you’ll be afforded enough time to perform most cooking tasks without harm. As Seen on TV aficionados will recall very similar products in recent months such as Hot Hands (read our review), Grabtastic (which is no longer available), and Ove Glove. There are also a number of silicone oven mitts to be found, many of which are highly rated. The Griller Pro gloves are probably the most competitive option, at about $10 and 4.7 star rating among nearly 200 reviews. If you haven’t used silicone gloves in the kitchen, you may want to consider taking the plunge. This pair of silicone gloves is certainly a good place to start, although you may want to consider other options if you have large hands. Have you tried OXA Silicone Cooking Gloves? Please give it a star rating and comment below. Sweet Slice Watermelon Slicer: Does it Work?